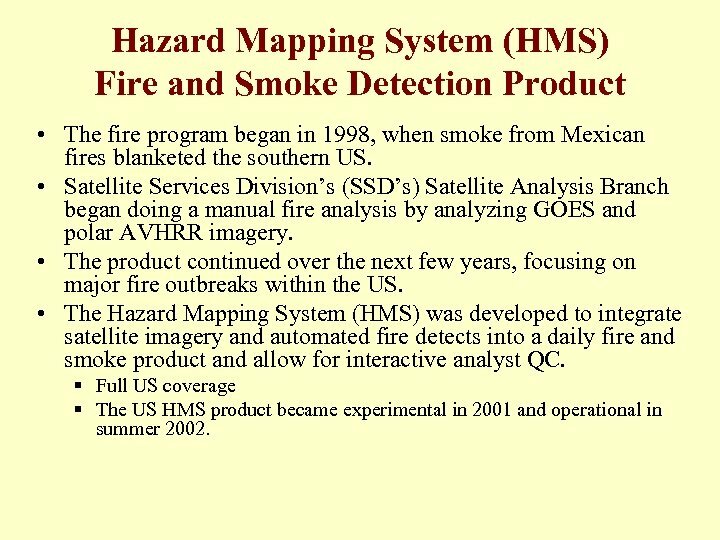 Hazard Mapping System (HMS) Fire and Smoke Detection Product • The fire program began in 1998, when smoke from Mexican fires blanketed the southern US. • Satellite Services Division’s (SSD’s) Satellite Analysis Branch began doing a manual fire analysis by analyzing GOES and polar AVHRR imagery. 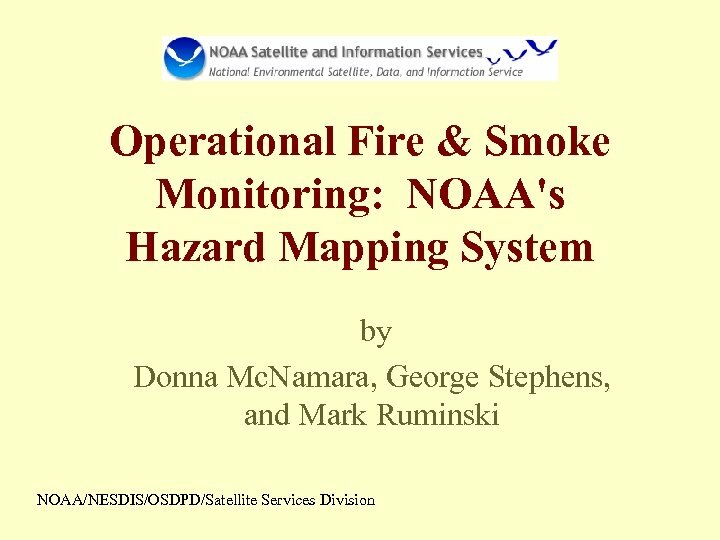 • The product continued over the next few years, focusing on major fire outbreaks within the US. 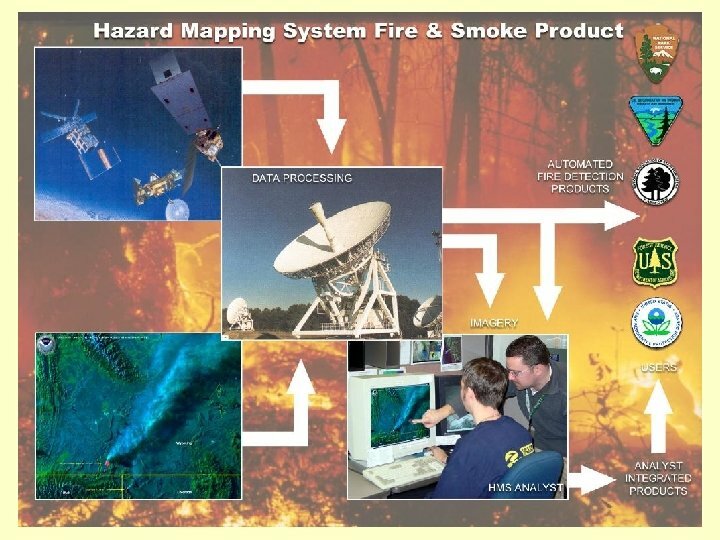 • The Hazard Mapping System (HMS) was developed to integrate satellite imagery and automated fire detects into a daily fire and smoke product and allow for interactive analyst QC. § Full US coverage § The US HMS product became experimental in 2001 and operational in summer 2002. Input Layer – WF-ABBA from GOES 1. 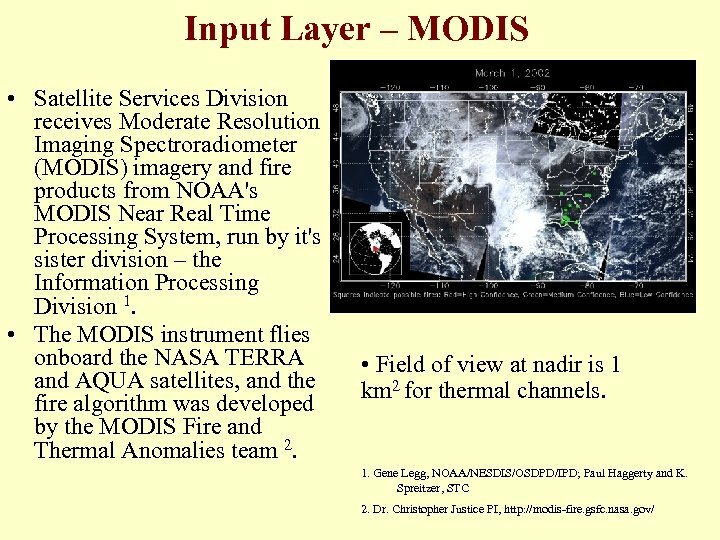 Dr. Elaine Prins, NOAA/NESDIS Office of Research and Applications/Cooperative Institute for Meteorological Satellite Studies (CIMSS) at the Univ. of Wisconsin. Chris Schmidt chief programmer. 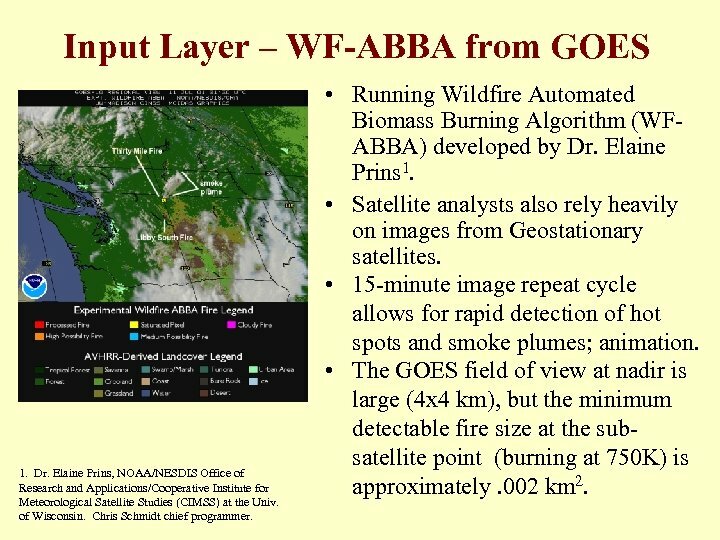 • Running Wildfire Automated Biomass Burning Algorithm (WFABBA) developed by Dr. Elaine Prins 1. 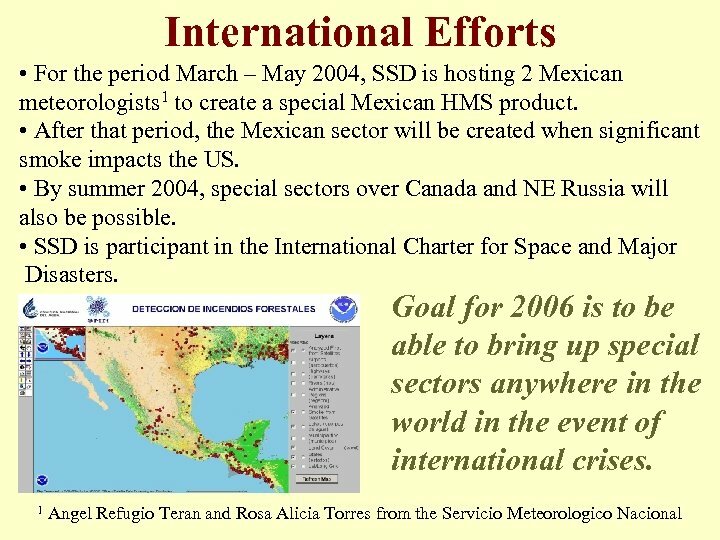 • Satellite analysts also rely heavily on images from Geostationary satellites. • 15 -minute image repeat cycle allows for rapid detection of hot spots and smoke plumes; animation. 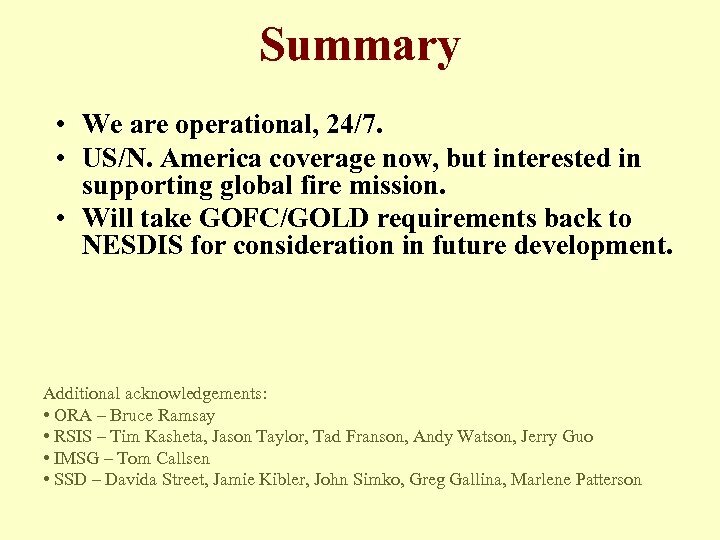 • The GOES field of view at nadir is large (4 x 4 km), but the minimum detectable fire size at the subsatellite point (burning at 750 K) is approximately. 002 km 2. 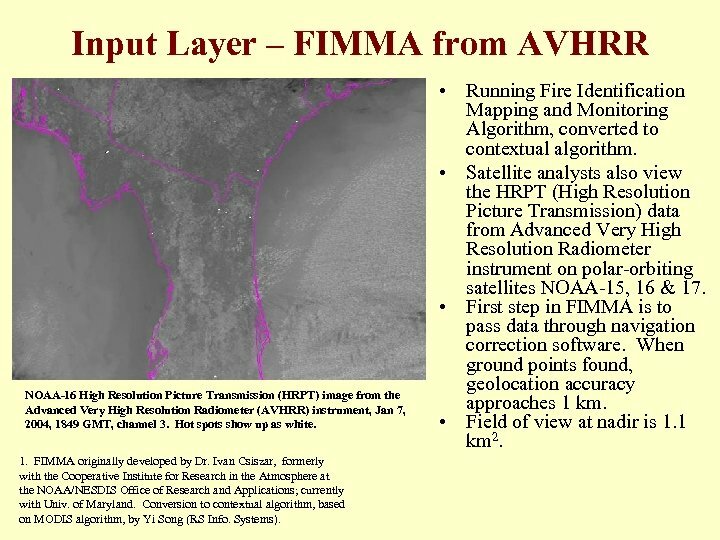 Input Layer – FIMMA from AVHRR NOAA-16 High Resolution Picture Transmission (HRPT) image from the Advanced Very High Resolution Radiometer (AVHRR) instrument, Jan 7, 2004, 1849 GMT, channel 3. Hot spots show up as white. 1. FIMMA originally developed by Dr. Ivan Csiszar, formerly with the Cooperative Institute for Research in the Atmosphere at the NOAA/NESDIS Office of Research and Applications; currently with Univ. of Maryland. Conversion to contextual algorithm, based on MODIS algorithm, by Yi Song (RS Info. Systems). • Running Fire Identification Mapping and Monitoring Algorithm, converted to contextual algorithm. • Satellite analysts also view the HRPT (High Resolution Picture Transmission) data from Advanced Very High Resolution Radiometer instrument on polar-orbiting satellites NOAA-15, 16 & 17. 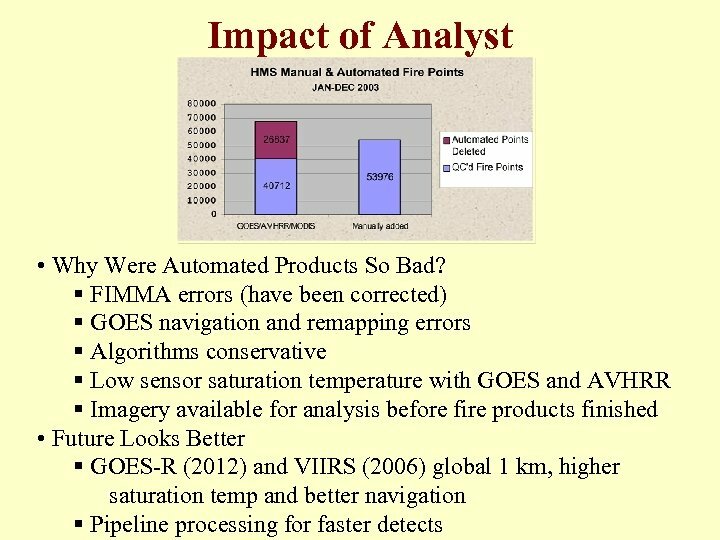 • First step in FIMMA is to pass data through navigation correction software. When ground points found, geolocation accuracy approaches 1 km. • Field of view at nadir is 1. 1 km 2. 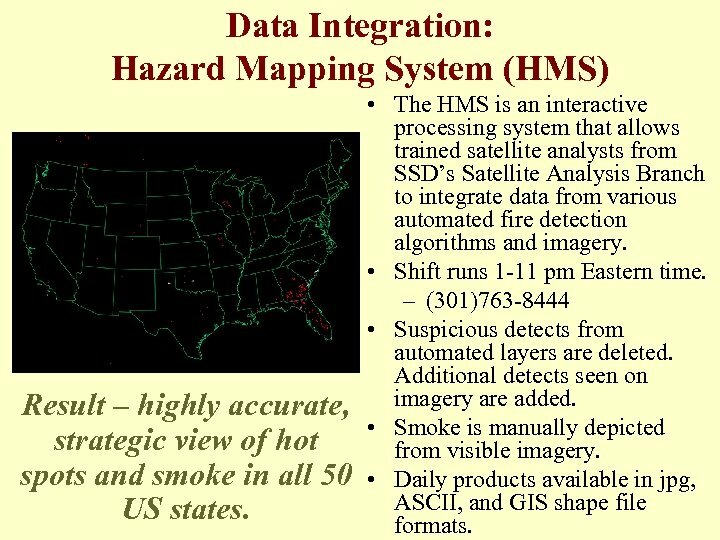 Data Integration: Hazard Mapping System (HMS) Result – highly accurate, strategic view of hot spots and smoke in all 50 US states. • The HMS is an interactive processing system that allows trained satellite analysts from SSD’s Satellite Analysis Branch to integrate data from various automated fire detection algorithms and imagery. • Shift runs 1 -11 pm Eastern time. – (301)763 -8444 • Suspicious detects from automated layers are deleted. Additional detects seen on imagery are added. • Smoke is manually depicted from visible imagery. • Daily products available in jpg, ASCII, and GIS shape file formats. Web-GIS Fire Page Links: http: //firedetect. noaa. gov http: //www. ssd. noaa. gov/PS/FIRE/hms. html http: //gp 16. wwb. noaa. gov/FIRE/fire. html 1. Boston University MODIS Land Cover project, Dr. Mark Friedl and John Hodges. 2. NOAA/NWS/Storm Prediction Center, Phil Bothwell & Gregg Grosshans. • Map server gives users access to layer updates in near real time, as well quality controlled HMS product from the analyst. 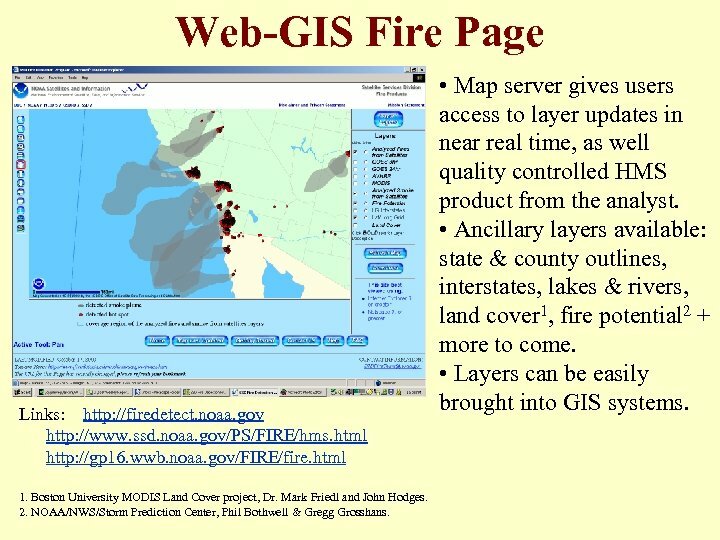 • Ancillary layers available: state & county outlines, interstates, lakes & rivers, land cover 1, fire potential 2 + more to come. • Layers can be easily brought into GIS systems. Can We Go Global? • • WF-ABBA from all GOES? Global AVHRR/VIIRS Global MODIS Data will exist, but need technology to integrate detects. • Product will be superior if we can keep human involved. • Possibilities for international cooperation with local analysts?